This Korean Curry Rice, made with an instant curry mix and served over sticky rice, is the perfect Korean comfort food. Serve this hearty dish with a side of kimchi for a quick and easy meal. I may not have grown up in Korea eating homemade Korean Curry Rice, but I did grow up eating roast with potatoes and carrots, which is what this meal reminds me of. Even with very different flavor profiles, the idea of comfort transcends in this dish. When we were at our bank a few weeks ago getting some paperwork notarized for our adoption from South Korea, the banker mentioned how much she loves Korean dramas (K-drama or KD). By the time we left her office I had downloaded two new apps- ‘DramaFever’ and ‘On Demand Korea’. You don’t need to subscribe or login or pay- it’s like free Netflix for Korean Dramas (most with English subtitles!). The first K-drama I watched was “Call Me Mother” and oh-my-goodness it was so good. The (mostly female) cast, the build-up and development of the storyline, the ending… it was all so good. Again, like Netflix, the entire binge-worthy season was all available at once. James and I watched the first episode together and then I went on to finish the entire thing without him because I just couldn’t wait! In the show, the little girl practices reading with take-out menus. One of her favorites is a restaurant that makes curry rice. 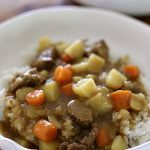 Curry rice becomes a sweet little theme throughout the series- symbolizing a mother’s love in preparing this comforting dish. 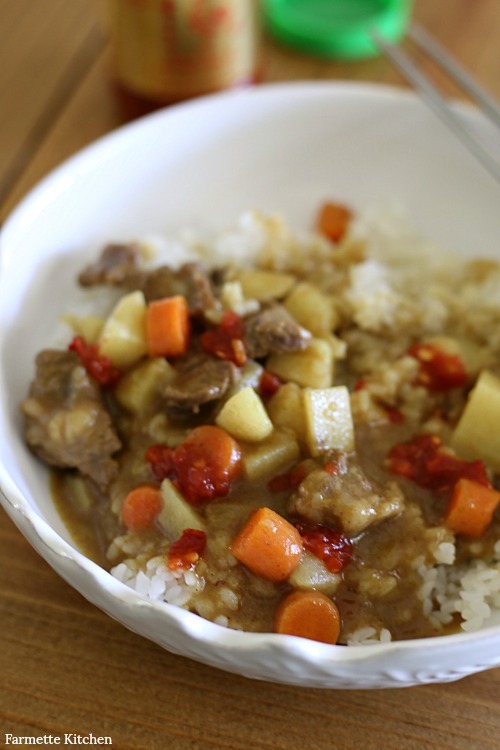 By the end of the show, I was dying to try (and try making) Korean Curry Rice! It’s been so healing to learn more about Eli’s birth culture. Making and eating Korean food has been like a soothing balm for my mama heart. It makes me feel closer to him in the wait while we are painfully miles apart. I hope that it can be that for him as well after he leaves his home of South Korea. In the meantime, I will do my best to perfect these Korean dishes for him in my Farmette Kitchen. 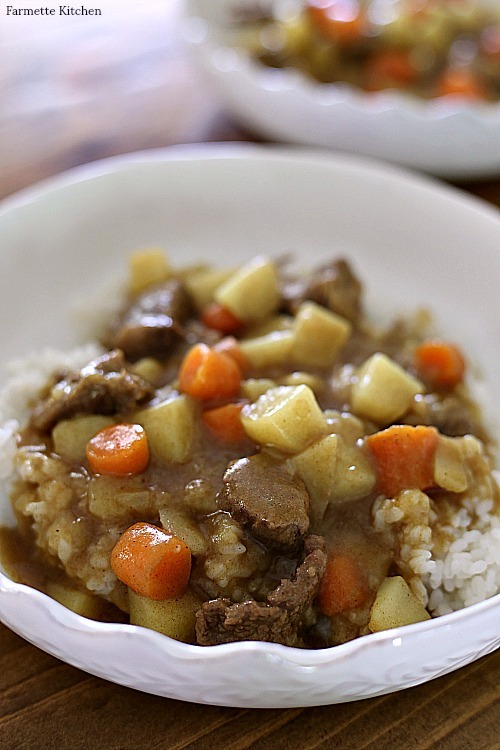 Curry Rice was introduced to Korea by the Japanese and has become a staple in Korean kitchens. Korean curry is milder than Indian curry and comes in an instant curry mix, making this dish so easy to prepare. 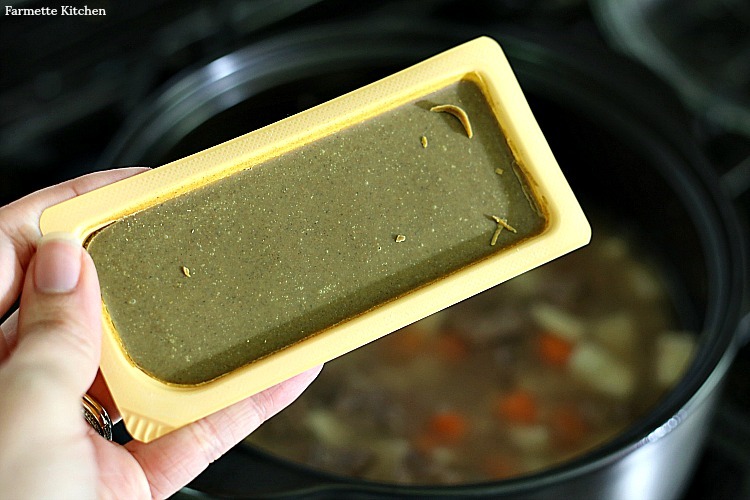 In Korea, the powder form is more commonly used but curry blocks (aka curry roux) have become popular as well. You can find curry packets at some grocery stores (I couldn’t believe it when I found mine at our small town Brookshires) and Asian markets, like Hmart. Most traditional Korean dishes are served with many sides (banchan) but this Korean Curry Rice is a delicious one pot meal. 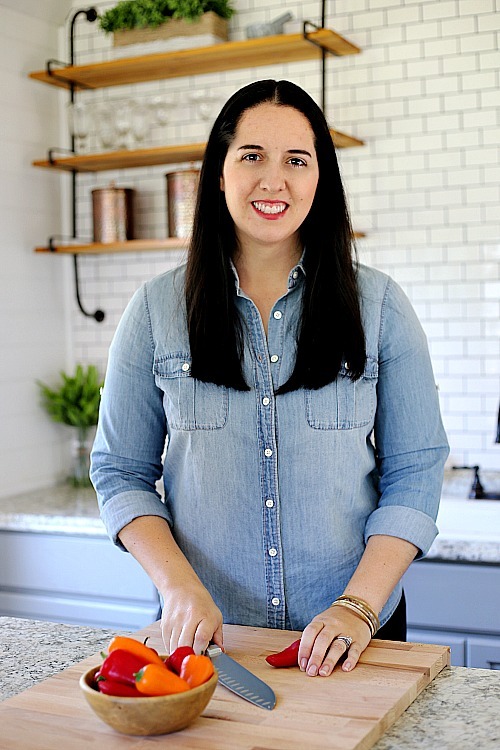 I used this super easy method to make Instant Pot Sticky Rice for this recipe. James likes to eat his with kimchi but I prefer a healthy sprinkling of fresh ground chili paste. We ate ours with metal Korean chopsticks because we like to practice, but this dish is typically eaten with a metal spoon. 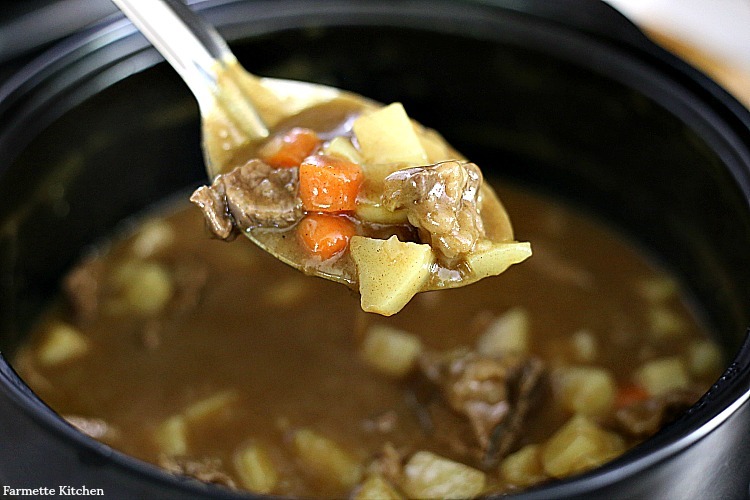 Warm the butter over medium-high heat in a large pot or Dutch oven. Add in the boneless beef short rib and diced onions. 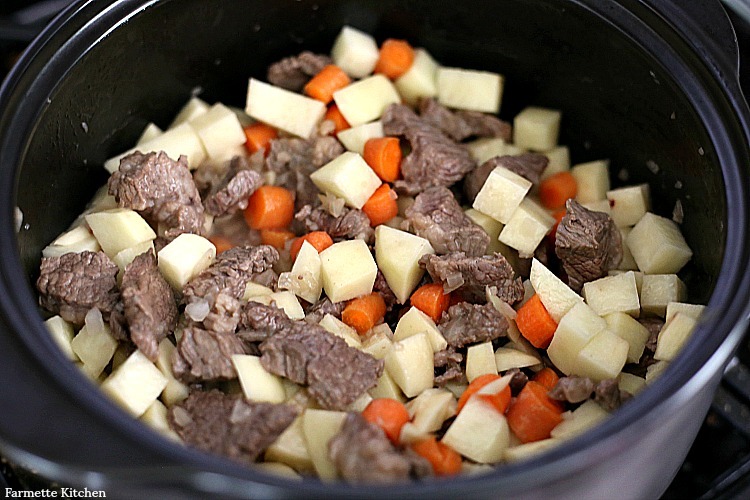 Sauté until the beef is nicely browned on all sides, 4-5 minutes. 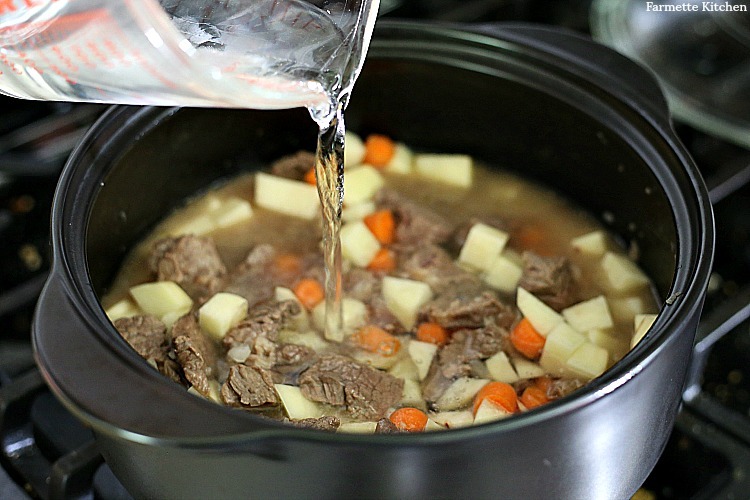 Add the carrots, potatoes, water, and curry powder to the pot and mix well. Serve over steamed rice with kimchi. You can use olive or sesame oil instead of butter. 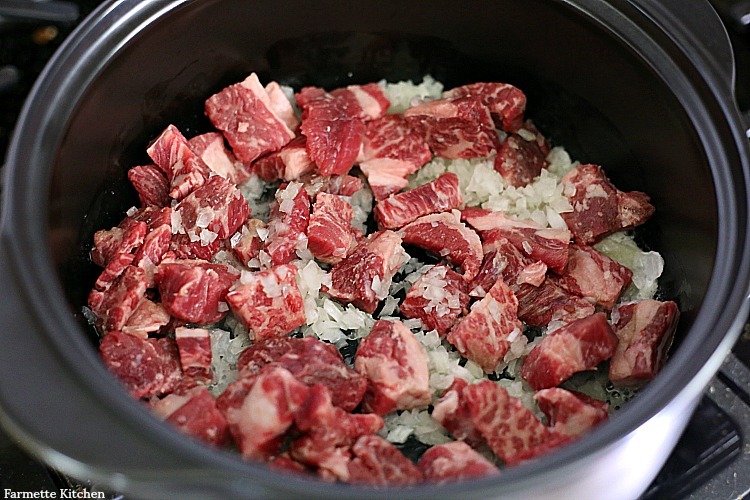 You can find boneless beef short ribs at your local Asian market- they may even have some already cut into bite-size pieces for Curry Rice. We need to make this again! !